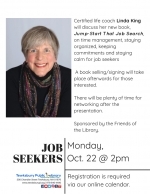 Certified life coach Linda King will discuss her new book, Jump-Start That Job Search, on time management, staying organized, keeping commitments and staying calm for job seekers. Learn more about Linda HERE. There will be plenty of time for networking after the presentation. A book selling/signing will take place afterwards for those interested. Sponsored by the Friends of the Library.